Well, the dream was like a Crossover of Aliens Vs. Predator & Teenage Mutant Ninja Turtles, though It seemed to center around the ninja turtles mostly. I don't remember how It started & I Can only remember parts of that dream. I remember seeing In that dream, Leonardo, The leader of the group who has the katanas and wears the blue mask, was In what looked to me like a training room, and then the next minute after, he comes out dressed up like Predator for some reason... He was wearing the Bio-Mask & the Armor. 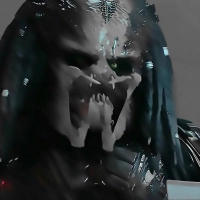 So he comes out dressed up like Predator, and he's looking around and then all of a sudden, a Xenomorph comes out of nowhere and attacks Leonardo but he Kills the Xenomorph. After that, more and more Xenomorphs swarming out, and Leonardo Is Surrounded by Xenomorphs. But where exactly? Well, it seems that where they are Is some place that looks like Its In the middle of Winter. And there Is what looks like a Base. The Shredder's Base, Shredder BTW is the main villain of TMNT, as well as the leader of The Foot clan. So they find Shredder's Base, and you know how every Movie has the Heros Infatrate an evil villain's Base by dressing as the guards? Well, something like that happened In my Dream, because the 3 knock out the Foot soldiers and then dressed up as them. They get Into the Base when they see The Shredder coming. That scared them so they ran Into the bathrooms and hid In the showers behind the shower curtains, of course they were panicing, and they kept moving the shower curtains trying to hide themselves. But then The Shredder walks In and see's the shower curtains moving so He came up and pulled back the shower curtains. He see's the 3 Ninja Turtle but he didn't recognize them because they were dressed up As the Foot Soldiers. Now I don't remember what they were saying at this point, but what I can remember was that It looked like The Shredder said something to them, and Raphael said something back to The Shredder. Now what He Said To Shredder? I can't remember... So Raphael says something to Shredder and It looked like whatever He Said to him made Him mad. So the Shredder Fired Raphael and asks Donatello to throw Him out... Keep In mind, The 3 were dressed up as Foot Soldiers! But Donatello refused to do so and that made Shredder mad and He Tells them something, I Don't remember what, and then Donatello asks The Shredder something, and for whatever reason, what Donatello asked Shredder made Him sad and for whatever reason, The Shredder starts singing and as He sings, Donatello starts singing along. Then Raphael stops the singing by saying something. And then at that point, thats when Mom woke me up for School. I Still remember that Dream til this day and I don't think I'll ever forget It!